Posted on 5, April 2019 by EuropaWire PR Editors | This entry was posted in Art & Culture, Entertainment, France, News, Portugal, Society and tagged Aquilino Ferreira, art, Art Shopping du Carrousel Louvre, artists, Cătălin Precup, Chuang Chih Hui, Dan Neamu, Daniel Cristian Chiriac, Domen Lo, Efrat Cybulkiewicz, Gabriele Esau, Genesis Cabrera, Henrietta Paulina Kozica, Jay Garfinkle, Jay Paul Vonkoffler, Maarten Vetart Vet, Marinha Grande, Mario Devcic, Octavian Florescu, Ofelia Hutul, Roch Fautch, Santiago Ribeiro, Shala Rosa, surrealism, Surrealism Now, Vu Huyen Thuong. Bookmark the permalink. 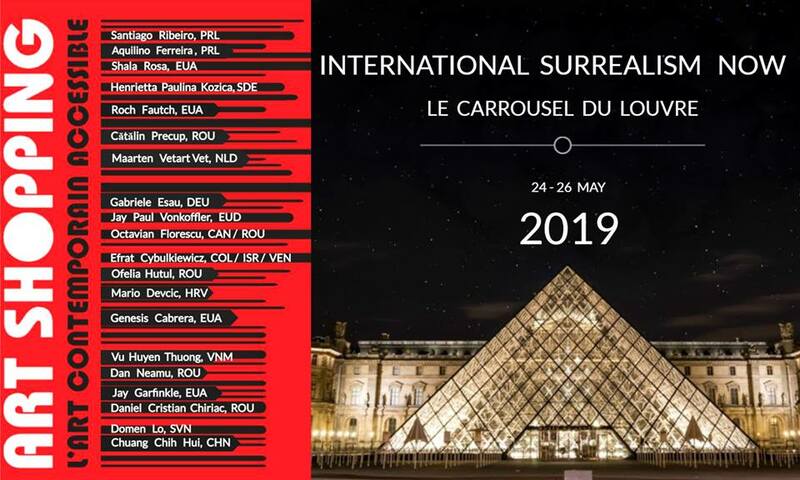 20 artists from Surrealism Now represent and promote in Paris the largest surrealistic spectacle in the world in the 21st century that has been held in Portugal since 2010. PARIS, 5-Apr-2019 — /EuropaWire/ — From May 24 to 26, an edition of the International Surrealism Now exhibition will be available to the public in Paris, integrating about 20 international artists belonging to the Surrealism Now project in Portugal. This initiative to be held at Art Shopping du Carrousel Louvre aims to promote and publicize the project that takes place in Portugal and which is its creator the artist of Coimbra, Santiago Ribeiro and which began in 2010 organized by the Bissaya Barreto Foundation. Twice a year, the Art Shopping trade show at Carrousel du Louvre offers a selection of works to see and buy. More than 450 artists and galleries present their works of contemporary art where this time will also include International Surrealism Now with around 20 artists. They are (with the link to the profile on Facebook): Jay Garfinkle, USA, Santiago Ribeiro, Portugal, Aquilino Ferreira, Portugal, Shala Rosa, USA, Dan Neamu, Romania, Efrat Cybulkiewicz,Venezuela / Colombia / Israel, Gabriele Esau, Germany, Roch Fautch, USA, Jay Paul Vonkoffler, USA, Mario Devcic,Croatia, Octavian Florescu, Romania / Canada, Daniel Cristian Chiriac, Romania, Domen Lo, Slovenia, Cătălin Precup,Romania, Maarten Vetart Vet, Netherlands, Chuang Chih Hui, Taiwan China, Genesis Cabrera,USA, Ofelia Hutul,Romania, Vu Huyen Thuong,Vietnam and Henrietta Paulina Kozica,Sweden. 99 Rue de Rivoli, 75001 Paris, França.